Just a few short years after the 2nd World War a new battlefront was being fought in the English countryside, and the farming community was on the frontline with orders to plant crops in every available acre of land, as the growing population would not expect to be suffering shortages of foods and ration books ever again as was the case during the war years. At the dawn of the 1950s agriculture was experiencing massive changes particularly in harvesting with a very gradual realisation that the new self propelled combine harvesters would greatly reduce the Labour involved in Harvesting the crops on every farm big or small, and this alone would set a trend that has not stopped to this day. This following story was given to me from Andrew Blagg along with a few black and white photos. Well known threshing contractor Joe Thorlby called in to see one of his many customers to enquire about what threshing he would require that season. 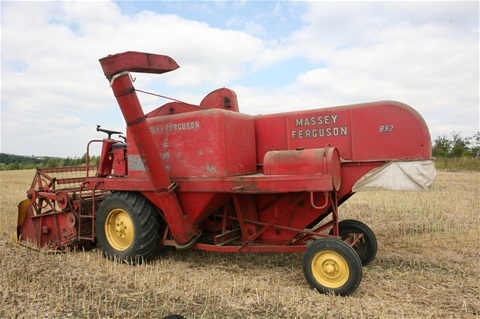 The customers name was Mr Ronald Harrison of Kilton Farm Worksop, in conversation with Joe Mr Harrison mentioned to Joe that he had just bought one of the new Massey Harris model bagger combines!. Well this news was quite a shock for Joe because it was some considerable work he would lose out on with Ronald, but as a favour Ron said he could borrow the combine anytime to help with his busy Threshing contracts, and this got Joe thinking perhaps he and Ronald should form a partnership with the combine!. And on the 1/10/1950 the partnership was formed and the new venture would be called Kilton Combine Harvesters. In the harvest of 1951 they ran a single Massey Harris Bagger, such was the success of this the following year another machine was added to an increasing workload. 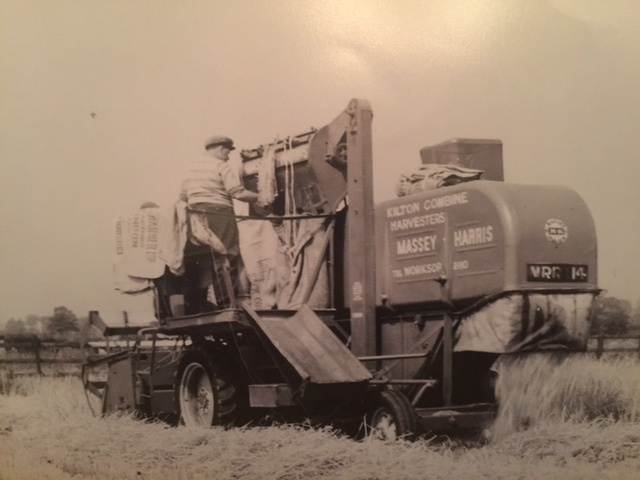 The harvest of 1952 would see another two brand new combines purchased which brought the total to four combines. Work was carried out in an area from Worksop, Retford ,Mansfield, Scunthorpe, Sheffield, and Rotheram. These combines had petrol engines at that time and every day during the season Joe would travel to the nearest petrol station and he would fill up Jerry cans with 100 gallons of petrol for the busy day ahead!. During their working season the team would come across many colourful characters. Farmers would contact Joe and say their crops were ready! But when they moved the combines there more often than not they were not and it was a way to get combines waiting at their farm and not any of their neighbours!. One such farmer who stored the combines every winter told Joe he was fed up waiting for his crops to be cut and seeing he stored their combines he expected better treatment! And failing this they would need to look for other storage facilities!. Well the following season Joe made sure that a combine was available as soon as this special customer rang, and his crops were harvested forthwith. A short time after harvest Joe met up with this gentleman and he said Joe Next time I ring you and ask for a combine please keep me waiting!! We cut the corn to early and it heated up in the bags and we lost most of the crop!. This was as Joe pointed out a common problem with some impatient farmers some would want to start just before their neighbours! Others just because rain was forecast later that week,and any advice from Joe would normally fall on deaf ears and then as now the customer was always right! but impatience and haste could be very costly indeed. The harvest season would normally get off to a slow start as breakdowns would occur frequently during the first two weeks because crops would be cut that still required more ripening, and the combines would suffer as the unripe crops were harder to thrash and despite a multitude of adjustments unripe crops would play havoc with combines as they do even today. Ron and Joe's Harvesting partnership was very successful and went on until 1963 at which time Mr Ron Harrison sadly passed away. His family decided to end the partnership and the combines were sold. 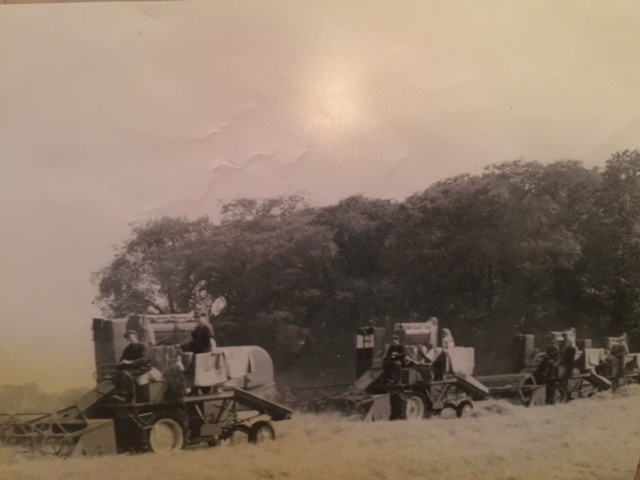 However Joe Thorlby continued with harvesting contracting and he purchased a Allis Chalmers gleaner C and his business continued on very successfully for many more years. As we approached the sixties the dominance of the self propelled combine had taken over from the reaper binder and the threshing contractor, and in some ways the social scene at harvest time when all the family members and friends would gather to help the farmers gather in their crops were gone also, my own father spent many harvests helping out and the reward at lunch time would be the finest farmhouse food and even a flagon of cider or two!! As he said this was reward enough for a hard day's work, and the satisfaction that the harvest was safely gathered in was such a great feeling. The job as such was hard work I have rode on a bagger as a young boy and the heat and dust and the physical effort to hump the bags off the combine was back breaking to say the least! I remember talking to an elderly gentleman who spent many seasons on a bagger and he told me he always kept on the right side of the driver! He was always right whatever he said! And I would buy him a pint regularly in the pub because he could make your life a whole lot worse pushing the combine through the heavy crops quicker making my job hell. During our own harvest we always endeavour to have a short break in the evening if possible and reflect on harvest pasts and the journey to this point in time, also despite the crisis in farming today we feel privileged to be able to do our own small part. The following photos really sums up what was the beginning of the new age of harvesting technology that continues to this very day, and pioneers like Joe and Ronald who grasped the new technology and advanced agriculture along with many others so the growing population would never know hunger, and we should all be thankful for that. 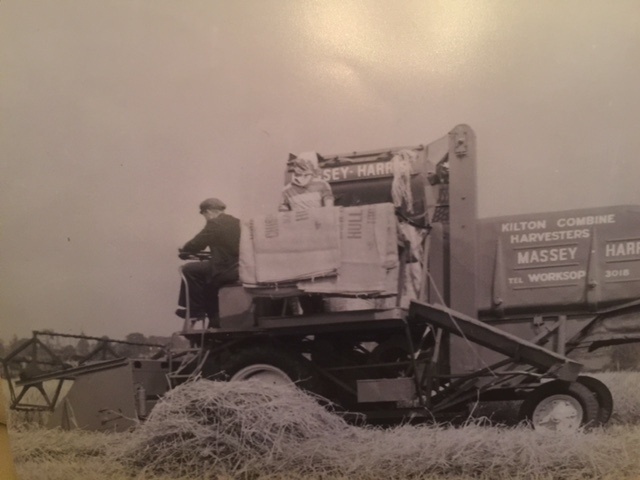 A cracking shot of Kilton contractors at work the future of harvesting 1953 If there is one image on this website that tells the world a change is coming! It's this one. The 2cwt sacks hang from the handrail awaiting filling and sliding to the ground! A big thank you to My friend Andrew Blagg who has shared this story and Photo's with us to feature on yellowswirl. Coming up we visit Andrews comprehensive restoration of his 780 combine harvester.